Mirage is a fantastically different game, reminding me somewhat of flower but far more dark. You control a swarm of glass shards travelling through a twisted nightmare of a landscape. Attacking creatures reduces your shard supply so picking your fights is important. This is currently a demo but is fantastic enough to warrant your time. WG Realms 2: Siege Breaker is a Duke Nukem total conversion that doesn't require the original game. It's a blast to play (no pun intended) and is far more kinetic than the original Duke. Prism: Guard Shield is a single and multiplayer FPS where you play a member of a futuristic version of the National Guard. The game can be played co-op which by reports is the best way to enjoy it. The engine is dated but it's free, no paid version, no microtransactions. 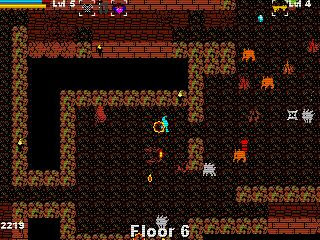 Shoot First is a roguelike with action in mind. Using the mouse to shoot and WASD to run around, it feels more like Alien Swarm than it does TOME. The Rise of Atlantis is a match-three bejeweled clone with power-ups and some extra puzzle solving thrown in for good measure. Looks casual and cheesy, but sometimes you only have a few minutes to unwind.